Samsung has taken a big step forward in its wearables effort—if only in its philosophy of what a wrist gadget should be. 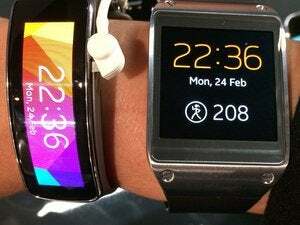 Last year’s Galaxy Gear smartwatch was aesthetically polarizing and bloated with half-baked features. It tried to stuff way too much into a user interface the size of a large postage stamp. 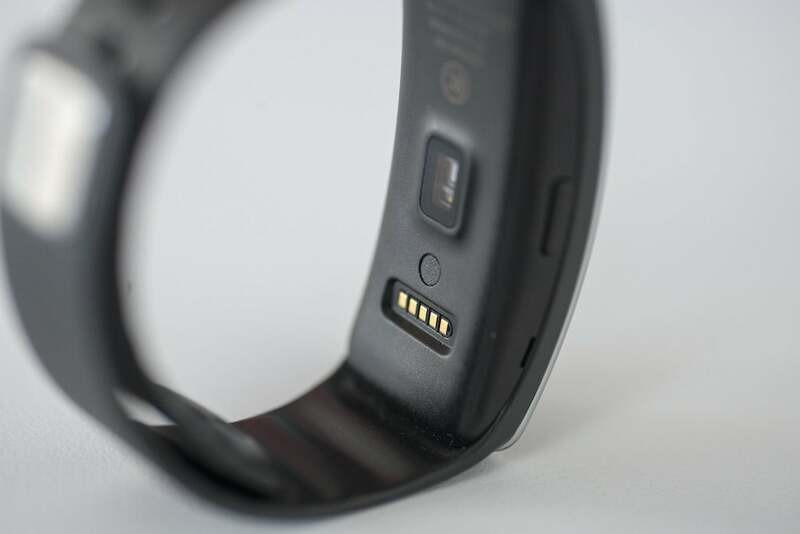 But the new $200 Gear Fit activity-tracking wristband is a much more approachable device, both in terms of industrial design and the “addition by subtraction” benefits that come with fewer features. The Fit includes an optical sensor that can measure your heart rate—but you need to shut your mouth and remain still. The Gear Fit doesn’t include a camera. It offers no voice control. You can’t use it as a watch-phone. And it doesn’t support third-party apps. Instead, this swervy, swoopy, curved-screen wearable is pretty much dedicated to exercise tracking and smartphone notifications. It’s a design direction that acknowledges we don’t necessarily want or need full-bore mobile command stations strapped to our wrists. 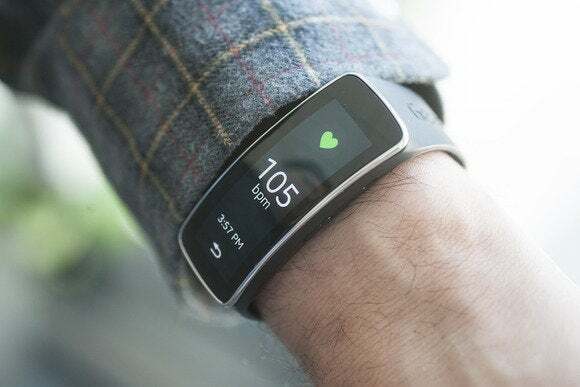 Just one problem, though: The Gear Fit isn’t a good activity tracker, despite the inclusion of an optical heart rate sensor, Samsung’s hot new gimmick du jour. The Gear Fit’s fitness features are both inaccurate and difficult to use. Counter-intuitively, its main smartwatch-like features—notifications—are what really shine. In the final tally, the hardware is a win, but the software is a fail. Samsung has finally found another home for the flexible display technology it’s shown at every Consumer Electronics Show since the repeal of the Volstead Act. And in Gear Fit trim it looks fantastic. The 1.8-inch Super AMOLED display rocks a super-sharp 432x128 resolution. Its dazzling colors and gently curved profile will compel strangers to ask you where you scored your groovy alien space watch—because it’s as sci-fi-looking as any hardware around. Of course, this isn’t a wristband that pairs well with a Harris tweed hunting coat or Chanel couture. But if your style is sporty or post-modern, the Gear Fit should blend in well. Use the Gear Fit Manager on your Galaxy phone to choose a bacground image. Or pick your own from a photo in your handset’s gallery. By default, the user interface orients horizontally, but thanks to a firmware update pushed right before the Gear Fit’s launch, you can view the screen in portrait mode. This is a critical addition that saves the wristband a full point in my final review score—the horizontal orientation is beyond awkward, and requires excessive arm and head contortions to read what’s on the display. You can choose from a large selection of clock faces and background themes, and even quickly create your own background from a photo on your Samsung Galaxy device. Yes, you’ll need hardware pairing to set up the Gear Fit and use some of its features. 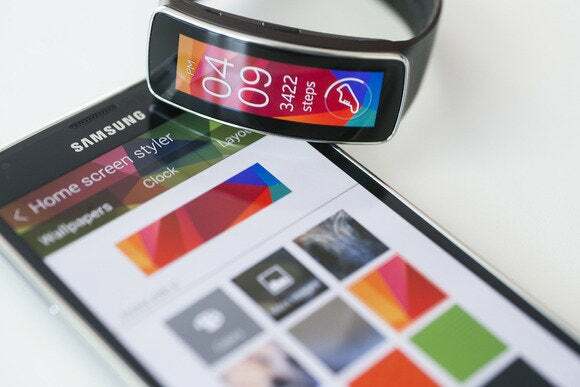 But at least 17 Samsung phones and tablets are supported, granting a generous degree of compatibility relative to last year’s Galaxy Gear, which launched with only a single smartphone in its friends list. The rubber strap is comfortable and relatively easy to attach. The Fit can be removed from its rubber strap and inserted in different-colored bands sold separately. The apparatus uses the same pin-based fastening system as the Fitbit Force, but it’s much easier to lock down—and, of course, the Gear Fit hasn’t been recalled for strap problems. While typing on a desktop keyboard, I found the low-profile strap as innocuous as my various wristwatch bands. Samsung’s user manual [PDF] recommends it be worn “comfortably” above the wrist so that the heart rate sensor makes proper contact with your skin. 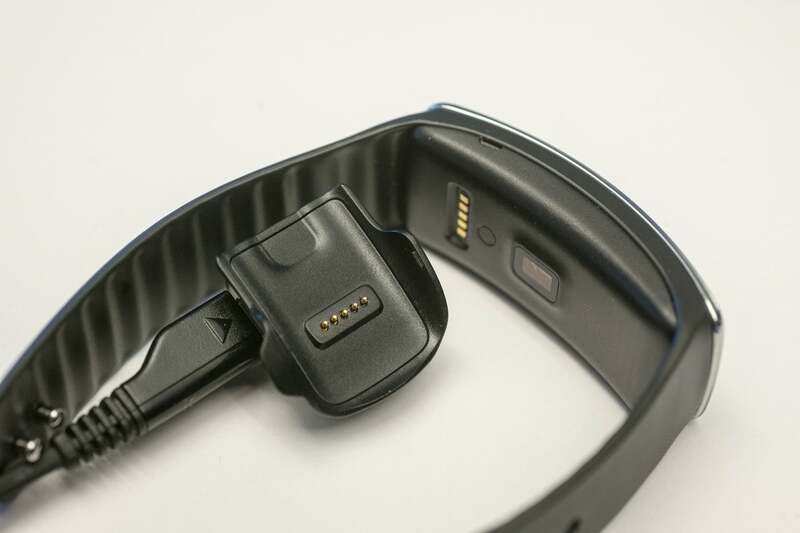 The device also includes an accelerometer and gyroscope to gather movement data. In theory, you can wake the display by raising your arm and turning your wrist (as if to look at the screen), but this function was inconsistent and depends on careful body positioning. 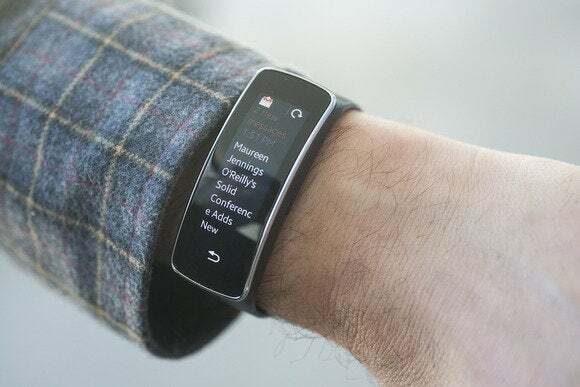 The upshot is that if you want to use the Gear Fit as a wristwatch—you know, a device that tells the time—you’ll have to be comfortable with frequently pressing the power button. Unfortunately the Gear Fit requires a propreitary charging cradle to top off its juice. Samsung’s Super AMOLED display technology is relatively energy-efficient, but I still only achieved little more than a day’s worth of use before receiving battery warning alerts at a 15 percent charge. Somehow, Samsung claims three to four days of use between charges. Granted, I was waking up the Gear Fit frequently during the rigors of product testing. But even if I experienced double the battery life of my testing regimen, two days is still a short cycle—activity trackers from Basis, Jawbone and Fitbit grant between five and 10 days on a single charge. And, no, the Gear Fit can’t be charged with a simple USB connection. It requires a proprietary cradle. And it’s not like those ever get lost. Hey, it’s called the Gear Fit. So it should be a great exercise tracker, right? It isn’t. Throughout three solid days of testing, I continually logged exercise data that just plain didn’t make sense. The Gear Fit includes six basic fitness functions. 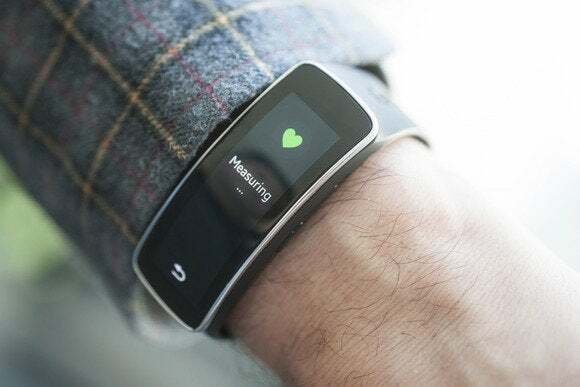 A heart rate monitor can log your ticker’s beats per minute, both while sitting still and in the service of monitoring various exercise goals. A pedometer function records how many steps you take each day. Then there are four specific exercise modes—running, walking, cycling, hiking—that provide coaching for those activities, and record key workout data, such as exercise duration, distance covered, and calories burned. Here’s an example of what seems to be an accurately recorded exercise session—in this case, a 36-minute walk. To test the hiking function, I set the Gear Fit to record my trek up and down Mount Davidson, a two-mile constitutional I take at least once a week. All the exercise modes include a goal feature, so I set the Gear Fit to give me mad digital props at the 30-minute mark—easily achieved for what is never more than a 50-minute round-trip hike. Well, as you can see from the photograph below, I must be a really fast hiker, as I covered almost 16 miles and burned nearly 1700 calories during my 45-minute workout. Yeah, I broke a three-minute mile—while hiking. The Gear Fit also showed I hit a maximum altitude of 1115 feet, even though Mount Davidson summits at 928 feet. And here’s an example of laughably inaccurate exercise logging. There’s no way I’m capable of a three-minute mile—let alone while hiking. 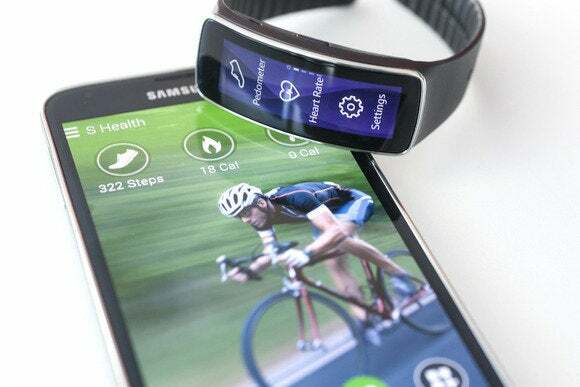 That was the most egregious example of inaccurate data logging, and in Samsung’s defense, the exact same hike the very next day was recorded as 2.14 miles traveled and 212 calories burned during a 47-minute workout. 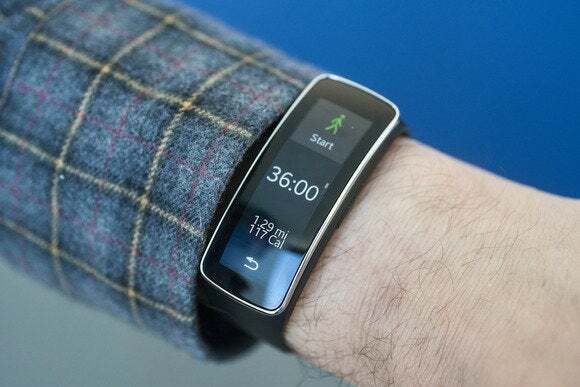 But throughout my three days of testing I also experienced inaccurate pedometer logging—and pedometer logging is table stakes for any fit-tech wristband. To wit: Wearing a Jawbone UP24 and Gear Fit on the very same wrist for the exact same waking hours, I recorded the following step counts. Thursday: 6255 for the UP24; 8494 for Gear Fit. Friday: 5835 for UP24; 7791 for Gear Fit. Saturday: 11,816 for UP24; 13,226 for Gear Fit. It would appear the Gear Fit is a wildly generous step counter, inflating its reports anywhere between 12 to 33 percent. 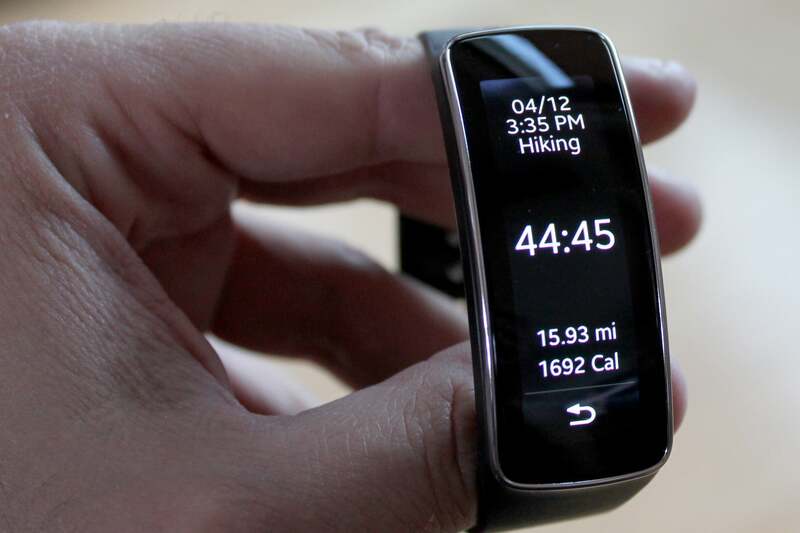 Three days into using the Gear Fit, I had serious concerns about its inflated step counts. Of course, the UP24 could be the inaccurate device in this comparison. And it’s important to note that none of the activity tracker manufacturers publish peer-reviewed data of their hardware accuracy. But when I’ve tested the UP24 against a FitBit Flex and Basis B1 band, all three devices have scored within about 200 to 300 steps of each other on days exceeding 10,000 steps. My takeaway? The Gear Fit needs its algorithms checked. Putting data accuracy aside, the Gear Fit’s exercise features just aren’t very easy to use. For starters, you have to manually engage the pedometer function each morning when you wake. Forget to do so, and your precious footsteps will never be recorded. The S Health app looks pretty, but is confusing to navigate and doesn’t adequately explain how it merges data with the Gear Fit. Then there’s the issue of basic feature transparency: The Gear Fit includes a lot of specific exercise functions, but none of them are explained very well. The interface menus on the Fit itself reveal almost nothing about how features work or how to use them. You can learn a bit in the Help menu of the Gear Fit Manager smartphone app, but even this is woefully opaque. And all the functions are still under-explained in the actual user manual. How, precisely, was I able to burn so many calories in so little time? The S Health app never made it apparent. For example, how exactly does the exercise coaching function work? During a treadmill jog, coaching prompts on the Gear Fit instructed me to “keep up this pace” one moment, and then “slow down” just seconds later—repeatedly, ad nauseam, even though I wasn’t demonstrably changing my pace. And during the middle of a treadmill jog, the Gear Fit displayed “TE 2.5” when I hit a certain goal. What does this mean? If it’s explained in either the Gear Fit Manager or user manual, I couldn’t find a reference. The accompanying S Health smartphone app that syncs Gear Fit data to your handset is also opaque. It took forever for me to find the key menu setting that tells S Health to shows Gear Fit pedometer data rather than data collected by my Galaxy phone. Overall, S Health has way too many features that are nested in layers of menus that are never sufficiently explained. Monitor your heart rate—but to what end? Finally, the optical heart rate monitor: It’s a curious addition, but I had trouble sussing out its usefulness, and its accuracy is also a question mark. Its primary application, it seems, is to measure your resting heart rate when you’re sitting motionless. The American Heart Association says a normal resting heart rate is between 60 and 100 beats per minutes, and the Gear Fit usually recorded mine between 80 and 85 bpm, which is consistent with numbers I’ve seen from a calibrated blood pressure monitor. It’s an interesting little feature, but I don’t see the resting heart rate function as a killer app worthy of headlining a $200 wrist gadget. The simple optical heart rate sensor is built into the rear chassis, and makes contact with your skin. But the heart rate monitor also keys into various active exercise features. For example, during a monitored hike, you can watch your heart rate data change in real-time, and at the end of your trek, you can dig into a History menu to see your average beats per minute. Should these numbers even be exposed? Probably not. Because they’re likely inaccurate. To wit: During a hike, I saw my heart rate jump from 108 to a ridiculous 162 over the course of 15 seconds. It’s important to note that even the Gear Fit user manual makes frequent mention of how heart rate numbers can be inaccurate under various conditions. But here’s the most telling advisory: “Take heart rate measurements when you are seated and relaxed.” If this is the case, then why even allow real-time heart rate reports during walking, running, cycling and hiking? This is the kind of inflated heart rate you get if you don’t sit still, and let the sensor do its job in peace and quiet. Come again? It’s weirdness like this that make me feel the Gear Fit is a better smartwatch than exercise tracker. I’ve just spent the better part of this review beating up on the Gear Fit for its exercise functions. But if you disentangle all the fitness features from the wristband’s repertoire, you get a nice smartwatch that generally works as advertised. 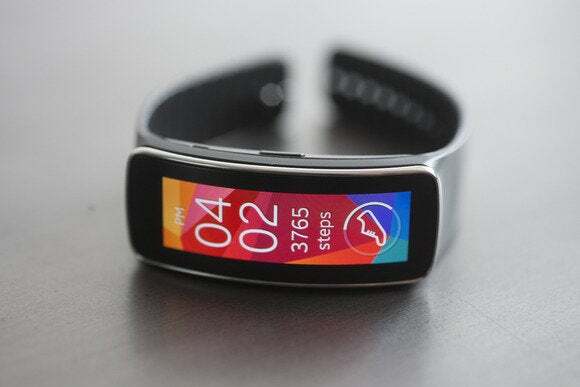 The Gear Fit provides notifications for phone calls, text messages, email and other applications emanating from your Galaxy phone. 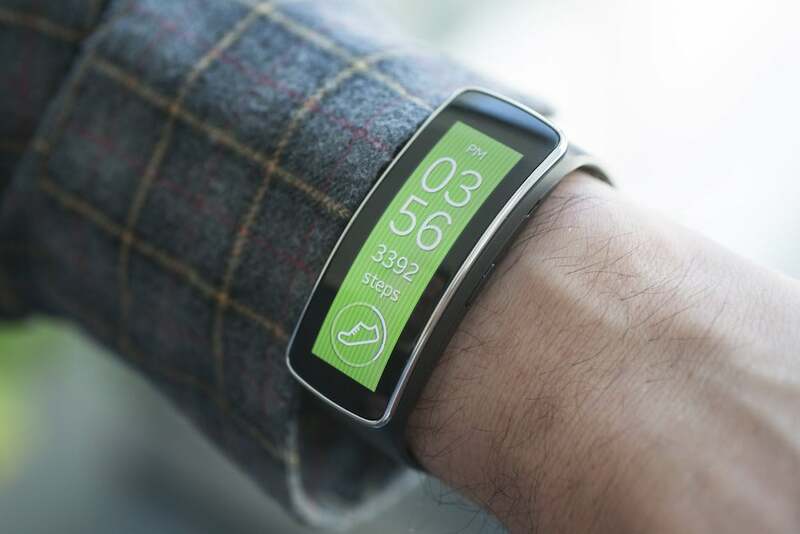 You feel a faint buzz on your wrist, and a notification pops up on the Fit’s display. I never once experienced problems with Bluetooth pairing, and the notifications function proved quick and reliable. Reading Gmail notifications on your wrist is damn nifty. Just make sure to set both the display and notifications toward a vertical orientation. You can read the entire text of an email message, and reply to texts and phone calls with simple, pre-formatted replies. (There’s no onscreen keyboard, so these replies will have to suffice.) You can’t fine-tune notifications to any helpful degree—like, say, defining a white-list of contacts whose messages are allowed to break through—but other smartwatches don’t allow granular control either. At least not without third-party apps. 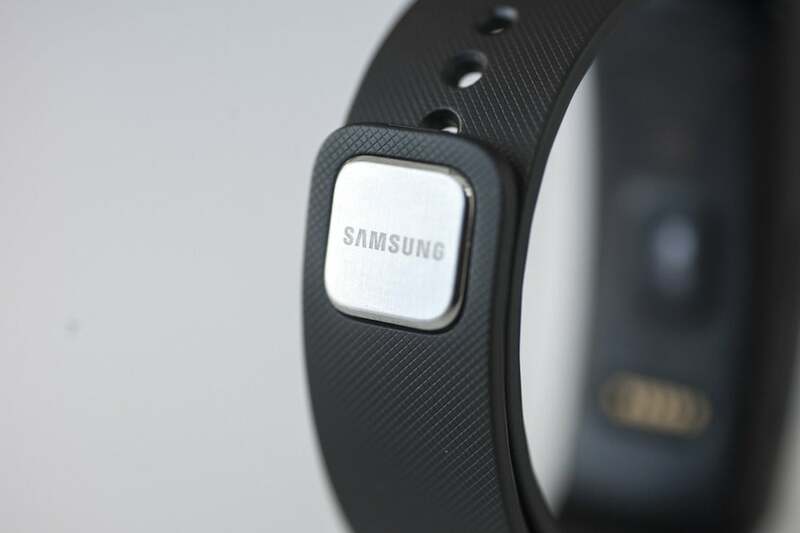 Half activity tracker, half smartwatch, the Gear Fit shows Samsung understands addition by subtraction. 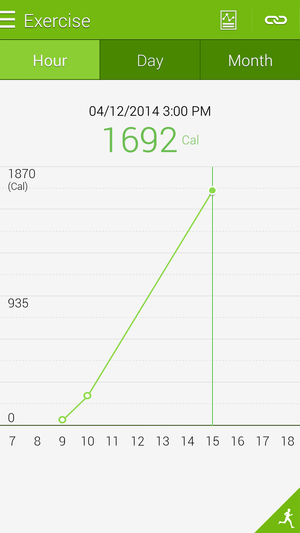 Sadly, though, its exercise tracking is inaccurate. Let's hope a firmware update fixes this soon. Attractive design (if you like ultra-modern).